This mystery has what many of the ones I've been reading lately have missed. Atmosphere, a mystery as the central part of the plot, and heart. Those things seem to be in short supply these days. Deborah Knott is a southern attorney and decides that she wants to run for judge. 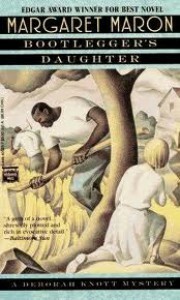 Her father is the bootlegger in the title, obviously, which has interesting connotations for a law-and-order citizen like Deborah. A friend of Deborah's asks for Deborah's help to solve the 20 year old murder of the friend's mother. Dredging up an old murder in the middle of a political campaign in a small southern town causes havoc in the lives of everyone involved. I've read a number of mysteries lately where the mystery felt like it was secondary to something else the author wanted to say. In that case, don't call it a mystery. In this book, the mystery is front and center and it's clever. I'm sure it's possible to solve it before Deborah does but I didn't. The warm damp southern atmosphere is also a star in this book. Atmosphere is key to me. The more I'm lost in the place I'm reading about, the better. Deborah's big extended family are a pleasure to get to know. If you grew up with a big family or anywhere near the south this will feel very familiar to you. If you didn't, you'll enjoy getting to know the Knotts. Margaret Maron reminds me of the Golden Age of mystery writers like Christie and Sayers. Not in style, but in the sense that the mystery is all-important. It's surrounded by a great setting, deep characters and superb writing but the mystery is still the center of the book. I'm moving on to book two as soon as I can get ahold of it.